The next half year of the Verkhovna Rada will be in election mode, as can be expected. And there’s nothing new in that. The long distance run that began with the opening of the 10thsession of the legislature demonstrated clearly that Ukraine’s MPs are unlikely to engage in any constructive work between now and their fall election. Of course, they will continue to babble about economic growth, strengthening the country’s defensive capabilities and reinforcing its strategic course, but Ukrainians might as well forget about real work. Lawmakers have already switched to campaign mode and are busy promoting themselves and wooing voters. If we add the number of them who are also running for president this spring, this is trend irreversible. Normally, the opening of the session has been accompanied by plenty of brouhaha: the balconies are bursting with visitors and reporters, the session hall is awash with inspiration, and the corridors are wall-to-wall with MPs and their entourages. Not this time. During the singing of the national anthem, the nation’s highest legislative body was half empty. How things will continue to unfold was evident from the fact that the agenda was filled with issues of a purely political nature. And that’s how it will be until the end of this convocation. No matter how VR Speaker Andriy Parubiy tried to introduce something constructive from the very beginning, threatening to turn off microphones for anyone openly agitating during the debate of a bill, it was as effective as a poultice on a corpse. 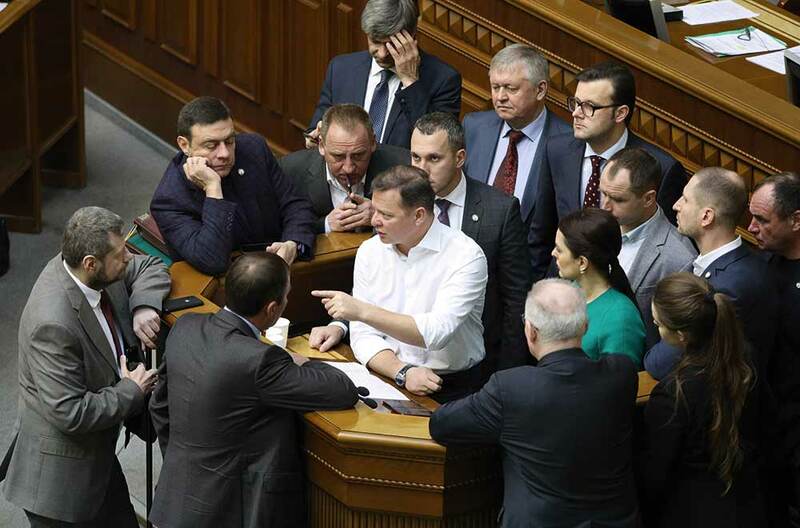 Oleh Liashko’s boys started off by blocking the tribunal and demanding that the price for natural gas be reduced, effectively paralyzing the work of the Rada. Nor is this hysteria likely to die down and the VR to work more productively after the presidential election March 31. If anything, the situation will get worse. Deputies will be under pressure, knowing that not only is this their last full-fledged session, but also that it is their last chance to show themselves in all their glory. By September, when the summer recess is over and the final waltz begins, no one will be working at all. But worse, the election could overturn the political situation, depending on who wins the presidential election, the incumbent or someone new (old). So it’s anybody’s guess whether Ukraine’s voters can expect at least something positive in the work of their MPs. The draft agenda has a whopping 2,817 bills and other items that need to be reviewed, but on the first day, MPs weren’t even able to approve the agenda itself. There are obviously some issues that they will not be able to avoid, such as amending the Constitution to state that Ukraine is aiming for membership in NATO and the EU, for which the president has been lobbying, or the bill on the Ukrainian language. Although everyone understands that these will be feathers in Poroshenko’s campaign cap and that he will use them to the maximum in his campaign, support for both bills will likely be found in the Rada. Firstly, to vote these particular bills down just as the country is exercising its democratic rights would be bad for the image of all those running, except perhaps for politicians counting on the pro-Russia vote. Secondly, these accomplishments won’t do much for the president’s rating. For those who dislike Poroshenko, joining NATO is not an especially powerful argument in his favor, while the fact that his own party’s faction almost voted the language bill down in first reading has not been forgotten. A much bigger challenge will be getting lawmakers to focus on other important issues that need to be settled: passing second reading of the Electoral Code, lifting immunity for MPs, and setting up a committee to oversee the work of the security services. Everything will depend on how high the tensions rise in the ward and in the hospital itself and whether it will be possible to agree on anything at all – or with anybody. Even among politicians who are tied by some agreement such a coalition, trust has never been high in Ukraine. In the run-up to an election, this only gets worse: every step is perceived to be an insidious move by rivals hoping to leap ahead of them in the presidential and legislative elections. There is growing opinion that changes to the election law will never e passed, but the situation is not so obvious. On one hand, this is a slippery issue that not many will be prepared to resolve during an election season. It could be dangerous and even backfire. On the other, if it’s put off for the next legislature to resolve, why not? The vote can always be cancelled, while having yet another accomplishment to flaunt and get praised for won’t hurt anyone. The same is true of immunity. But here PR plays an even bigger role with even less to offer MPs, so its prospects are even more doubtful. The situation should be a bit simpler with the package of economic legislation and legislation necessary to implement the Association Agreement with the EU. Perhaps a security services oversight committee will be set up, decommunization completed, and Dnipropetrovsk and Kirovohrad Oblasts renamed. The coalition will most likely survive, but it’s not so clear that a visit by the Head of State to the chamber at this point will be seen as a win-win proposition for all concerned. MPs tend to be governed by a more primitive logic right now than in quieter times: Why should a lame-duck president be telling us what to adopt? Everything will depend strictly on the position of a given faction, and sometimes even the positions of minor groups within these factions, and their electoral interests. If these little groups think it’s important to support a given bill, the will. If not, then not. Based on the pace at which the first day progressed, anything is possible. The bottom line is that it’s impossible to predict the fate of any given bill in the Rada right now. The work of MPs during a heating up election season coupled with a war and all its hybrid manifestations can be affected by just about anything at this point – even the court decision to remove the acting Minister of Health from her duties, which both the initiators and any bystanders who want to, will take advantage of. In fact, that’s precisely why these things are done. Liashko calculated the time for the provocation to suit those who sponsored it. There’s one thing he didn’t take into account, however. This entire scenario could suddenly turn and bite him, and then haunt him for his entire election campaign, because it’s clearly intended to cause a furore. And that’s wherein the danger lies. What can be expected in the final sprint and who will prove the winner, no one knows. Even if this is just one of many steps about to be unleashed as part of a grand gambit, it’s always good to remember that there’s not just one director running this show. There are others as well. And it’s a fight to the death between them. The cost of victory this time is too high. Without exaggeration, no one has come up with a computer program that can help any one candidate to figure out all the risks. For now, the situation continues to be unpredictable.